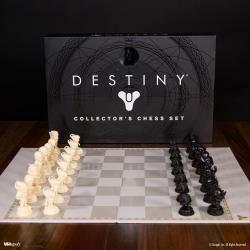 Destiny Collector's Chess Set Available Now! Bungie�s hit first-person shooter meets the timeless tabletop strategy game of chess in this must-have for Destiny enthusiasts and gamers of all levels. Super charge your Destiny collection and play your favorite game in an eye-catching and all new form with the Destiny Collector�s Chess Set, available now!